What is this new travelogue about? What is different compared to the first trip? The country is still the same, but the setting is different. This time around it wasn't a "first time experience", so the nature of this travelogue will be less about culture shocks, although they haven't completely disappeared from this trip either (hey, it's still Japan). The biggest difference must be the locations visited. In my first journey I mainly concentrated in Tokyo and Kyoto (plus one day visits to Nara, Himeji and Nikko), but in this one I aimed to be more "on the move", using the JR Pass as much as I could. Another difference is being more focused on cutting expenses into a more affordable visit, which was a success thanks to cheaper flight tickets, accommodation choices and avoiding souvenirs (which many relatives and friends weren't too happy about). It still was a expensive visit, though. First, the thought of visiting the country again came when I noticed a discount campaign from Finnair, which has a direct flight route between Helsinki and Tokyo (Narita international airport). When one of my good friends in Tokyo welcomed me to stay in her apartment while in Tokyo, the signs were right for a second trip. On top of that, I desperately needed a vacation anyway. I was first thinking I would explore only Tokyo, but then came to the conclusion that if I was to go as far as Japan, it would be dumb just to settle for the capital at that point. Besides, the railway system in Japan was a very positive experience for me the last time, so I was looking forward in using it again. When I was checking the availability of flight tickets for certain days, I noticed that sometimes the website where I could reserve the tickets said there were no campaign tickets left for some flights, but the next day they were again available (this was a tip if using Finnair!). Once I reserved the flight tickets I was fishing for, they came via snail mail two days later. Now I had about a month to prepare for my trip. I picked up three travel books of Japan from a library and wet my appetite by browsing beautiful photographs of the country while thinking where I should go. A two week visit turned out to be short when I was making my itinerary, but I decided that during the first week I'll head north and explore the Tohoku region, then go even further north to Hakodate which is located in the island of Hokkaido. From there I'll return to Tokyo to spend the weekend with a Japanese friend. On monday I'll move on to Osaka to watch sumo. Then the schedule gets very tight as I want to visit Hiroshima, Miyajima, Nagasaki and Kagoshima. I knew I would have to drop one of those locations, as I would return to Tokyo on friday for the last two days before returning home. I made a few accommodation reservations about a week before departure: one night in Tokyo (ryokan Kangetsu), two nights in Sendai (Toyoku Inn), two nights in Hakodate (Jal City Hotel) and one night in Osaka (Kaneko Hotel). The rest of the nights outside Tokyo I left to search in Japan. 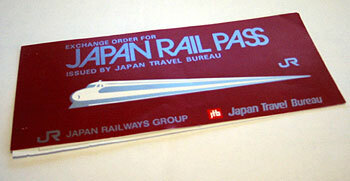 I bought a 14-day Japan Rail Pass Exchange order from a local travel agency one week before the trip. I also took a travel insurance and made a money transfer at Forex (a scandinavian money exchange office) for 1000 euros (about 135,000 yen). I also took both of my credit cards with me (Visa and Mastercard). One dilemma I had was what clothes I should take with me, as I was going to visit both the northern and southern islands of Japan, the first being close to sub-artic and the other close to sub-tropical. Since I aimed to pack lightly, I reckoned I could survive one cold day at Hakodate without winter clothes. A winter cap and gloves should be enough. Otherwise the weather shouldn't be a problem during March thanks to fair temperatures and low chances of rain. The forecast that interested me most was the forecast for the cherry blossoms around Japan. The Japan meteorological Agency website had a map with the estimated dates and areas when and where the cherry trees are expected to bloom this spring. According to it I should be lucky enough to see the blossom at least in Tokyo during the last days of my trip (unusually early). One last minute change to the plan came when I managed to contact a Japanese woman who visited Finland and my family 20 years ago. So we agreed to meet, but where and when, that was still open when I boarded the plane in Helsinki. The last remaining days I tried to avoid catching a flu the rest of my roommates were having (and succeeding in it, yah!). So read, learn and at least avoid the possible mistakes I made (no worries, no major mistakes were made). I hope most of you find this travelogue worth your time like the previous one. Saa, hajimeyou (Okay, let's start)! back to top | proceed to departure day! 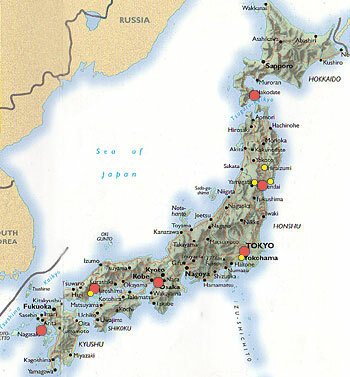 The red dots show the locations I spent at least one night (Tokyo, Sendai, Hakodate, Osaka, Nagasaki and Hiroshima). The yellow dots are day excursion spots I visited (Matsushima, Yamadera, Hiraizumi, Yokohama and Miyajima). The key to the JR Pass, the exchange order that has to be bought before going to Japan. My luggage for the two week trip. 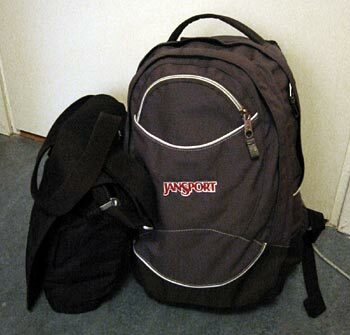 One shoulder bag and a jam packed back pack. A simple and mobile solution. 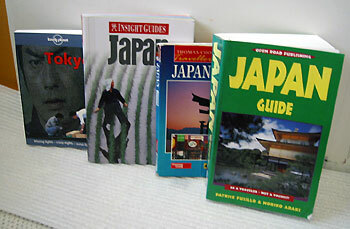 Books I used to plan the trip (from left to right): Lonely Planet Tokyo, Insight Guides Japan, Thomas Cook Traveller to Japan, Open Road's Japan Guide. Air flight tickets: Finnair direct flight (Helsinki-Narita, Narita-Helsinki). Train tickets: 14 day Japan Rail Pass, tickets to and from Yokohama, ticket to Narita airport. Accommodation: Kangetsu (Tokyo), Tohoku Inn (Sendai), Jal City Hotel (Hakodate), Kaneko Hotel (Osaka), Nishikiso (Nagasaki) and a Youth Hostel (Hiroshima). Food, entry fee tickets, souvenirs, tram tickets, etc. Note: exchange rate during this trip was about 135 yen per one euro.